Media and Contents: Hard cover; 166 pages plus covers; high quality glossy presentation in portrait 8.5” x11” format; 18 colour profiles; two full-colour pages of emblems, unit badges and tail/wing markings; additional monochrome profiles with aircraft data; seven colour photographs; one colour chart; documents and victory list; 175 historical photos. Advantages: Very comprehensive photo and profile coverage of the colours and markings of "Assi" Hahn's aircraft; interesting and readable episodic text; much of it in the first person; gorgeous artwork by Tom Tullis; discussion of colour controversies (especially for the yellow-cowled Bf 109F-2) excellent format for modellers; four associated decal sheets from EagleCals. Recommendation: Highly Recommended for aviation enthusiasts and modellers. Jerry Crandall has a lifelong passion for aviation in general, and Luftwaffe history and aircraft in particular. He is also a modeler. Both of these traits shine through in Jerry Crandall's latest book, 'Major Hans "Assi" Hahn: The Man and his Machines'. This 166 page title is full of readable episodes, focusing on the flying career of this famous Luftwaffe pilot; but also touching briefly on his beginnings (including how he got his "Assi" nickname), his capture and imprisonment by the Soviets in early 1943 and his post-war fortunes. Each Chapter revolves around a specific episode in Major Hahn's life. Many are first-hand reports either from the man himself or by contemporaries. Although the story of "Assi" Hahn's Luftwaffe career is interesting, the text is really brought to life by the 175 historical photos. A large number of these are previously unpublished, and many feature previously poorly documented or controversial aircraft. Any ambiguity about colours and markings is discussed in the text - Jerry Crandall really does understand what modellers are interested in. Tom Tullis does his usual excellent job with no less than 18 colour side profiles. Two of these profiles are presented on each page in landscape format - plenty big enough to see all the detail of the artwork. Tom has also illustrated Assi Hahn's personal profiles and aircraft markings in in the colour section. Additional resources include technical data on the major aircraft types flown operationally by Major Hahn, and a detailed colour reference chart for each specific aircraft. The book is rounded out with a number of original wartime colour photographs, documents and a Victory list. 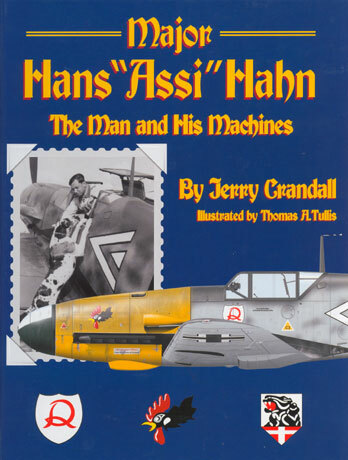 'Major Hans "Assi" Hahn: The Man and his Machines' is an excellent reference for the wartime flying exploits and machines of this famous Luftwaffe pilot. It is presented in a perfect format for modellers, and is especially valuable due to the availability of four associated decal sheets from Eagle Cals (also reviewed here on HyperScale).